Considering the riot act read by Indigenous People of Biafra (IPOB) through her Media and Publicity Secretary, Comrade Emma Power whe they said verbatim that it will attack Ohaneze Ndigbo anywhere they gather publicly to discuss about restructuring of Nigeria, the battle line has been drawn bewteen IPOB and Ohaneze Ndigbo. It is going to be a period of time of knowing the real owner of the land. 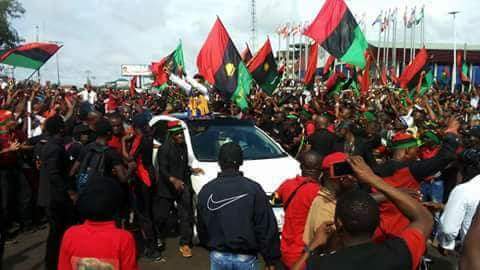 The world will know if it is few old political fools in Ohaneze Ngigbo or the mass movement of Biafra Land call IPOB are the true owners of the land. But as for Ohaneze Ndigbo, they are already in the black book of IPOB due to their treachery and sabotage. It is time go to such events with gallons of acid and fuel incase need become to burn down the venue. Ohaneze Ndigbo could be few days away from tasting the venom of IPOB.